It’s all fun and games until a balloon hits an airplane. On Thanksgiving day 1924, hundreds of Macy’s department store employees came together to celebrate one of America’s most treasured holidays: Christmas. Yes, the famous Macy’s Thanksgiving Day Parade officially began as the Macy’s Christmas Parade—and that’s not even close to being the most unusual change in the beloved procession’s 92-year history. 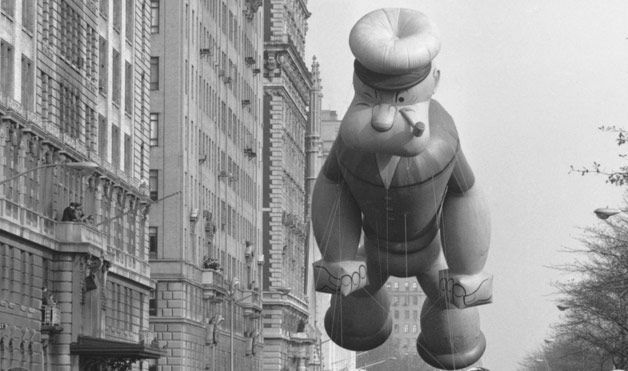 Read on for the bizarre story of power-walking elephants, balloon bounty hunters, the poor souls who have to wash all 4,000 costumes every year, and more fascinating facts about the Macy’s Thanksgiving Parade. The Macy’s parade was way furrier from 1924 to 1926. 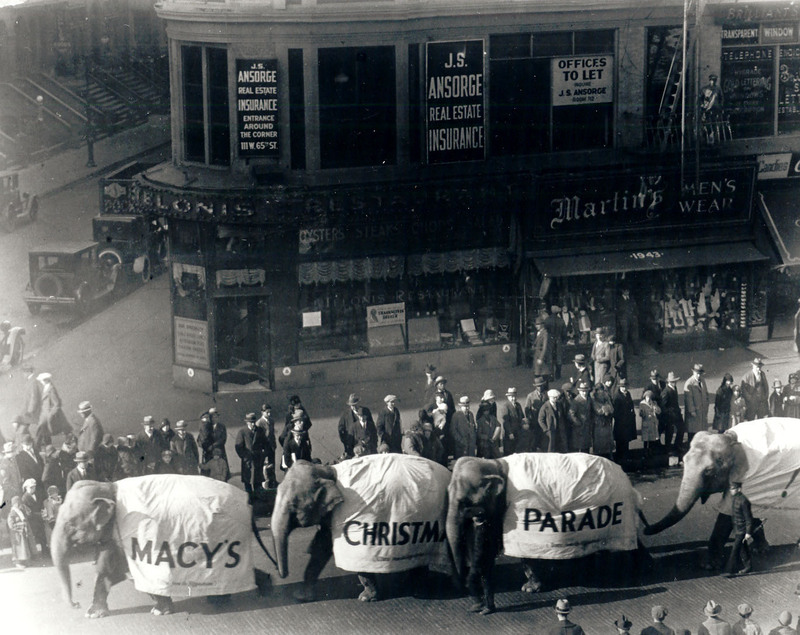 Borrowed from the Central Park Zoo, a procession of elephants, camels, tigers, goats, and other live beasts strutted down the streets of New York for the crowd’s amusement, some draped in Macy’s pennants to advertise the show. After 1926, the zoo animals were replaced with the huge helium balloons we know today; supposedly, live beasts freaked out the kids too much. Don’t miss this Thanksgiving timeline to planning the ultimate meal. For the first few years, parade officials had no plan for deflating their massive balloon companions. Their solution: just let them fly away and explode in the atmosphere. In 1928, Macy’s even made a game of it. Handlers released five balloons—an elephant, two birds, a ghost, and a 60-foot tiger—into the sky and challenged bystanders to capture them for a $100 reward. The tiger landed first, on top of a Long Island home, inciting a vicious tug of war. “Neighbors and motorists rushed up from all directions,” the New York Times reported. “The rubberized silk skin burst into dozens of fragments.” Here are some more answers to your biggest questions about Thanksgiving. A 60-foot tom cat balloon was released after the 1932 Macy’s parade and nearly sparked disaster when an aviation student spotted it floating at 5,000 feet. Much to her instructor’s dismay, the 22-year-old student spontaneously decided to ram her plane into the cat’s neck (whether this was to collect the prize money or just make headlines, nobody knows). The balloon disabled her wing. The plane plummeted toward earth. The instructor seized control at the last minute, saving them both. Needless to say, that was the last year Macy’s released their balloons. In other amusing balloon malfunction history, the 1957 Macy’s parade was beset by a sudden rainstorm. Popeye the sailor man took the water in stride, collecting rain in the dip of his hat until it became too heavy for his rubbery neck to support. Popeye dropped his head, flooding the crowd below in a gush of rainwater, then bounced back upright and began the process again. For some more Thanksgiving humor, check out these funny Thanksgiving quotes. From 1942 to 1944, Macy’s president Jack Straus decided to cancel the parade for the first time ever due to America’s involvement in WWII. Luckily, all the parade planning wasn’t for naught: Instead of marching and throwing confetti, Macy’s donated 650 pounds of balloon rubber to the military. When the parade returned in 1945, 2 million spectators turned out, including, for the first time ever, NBC camera crews. Macy’s is the world’s #2 consumer of helium (the first is the U.S. government). But amidst a national helium shortage in 1958, it looked as though there would be no parade balloons. Fortunately, parade organizers came up with a creative back-up: Fill the balloons with regular air, then hang them from giant construction cranes like big, puffy marionettes. It actually worked: Here’s what that looked like. Today it takes about takes 90 minutes to inflate a large parade balloon with the roughly 12,000 cubic feet of helium needed to float. That much gas lifts about 750 pounds, and requires up to 90 handlers to keep it anchored. Love watching the parade on Thanksgiving morning? You’ll love these other fun Thanksgiving traditions. While the nation frets over news reports of creepy clowns, Macy’s runs a school or them. The parade’s so-called Clown U is led by the Big Apple Circus and trains about 900 volunteer clowns for every year’s parade. Be sure not to make any of these common Thanksgiving mistakes this year. Since 1968, the parade’s floats and balloons have been designed at the New Jersey-based Macy’s Parade Studio (which inhabits an old Tootsie Roll factory). Because it would be impractical (but awesome) to float the floats over the Hudson River, each massive stage must be folded down into 12-foot-by-8-foot boxes to be transported through the Lincoln Tunnel. The floats are built in detachable sections for just this purpose. Macy’s parade floats are proudly hand-painted, assembled, and glittered in Hoboken, New Jersey. To achieve a sparkle visible from helicopter footage, the Parade Studio orders glitter in 25-pound packages, and can go through 100 to 200 pounds of glitter for a single float. Here are some far less intense Thanksgiving crafts you can make at home. Macy’s provides costumes for most of their parade participants, which amounted to about 4,000 individual uniforms last year. It takes an entire month to get all those costumes laundered, and another month to reassemble them into their packages afterward. Keep a lookout for the Pillsbury Doughboy balloon this year. According to Macy’s, if he was actually made of dough, he’d make the equivalent of about 4 million crescent rolls. Meanwhile, the Ronald McDonald balloon will appear in the Macy’s parade for his 17th time, wearing a six-foot-long bow tie and a pair of size 200 XXXXXXXL-wide shoes. If you’re overseas and can’t watch the Macy’s Thanksgiving Day Parade, find out how to celebrate Thanksgiving in a meaningful way while abroad. It’s hard to say. But consider this: To construct a single new balloon, it costs at least $190,000. Once a balloon is built, it costs about $90,000 a year to maintain after that. And while many parade performers are volunteers, they require more than 300 dressers and makeup artists to get TV-ready. The Macy’s parade is a full-time business—and with about 50 million annual TV viewers, business is booming. Here’s why you should consider seeing the Macy’s parade in person this Thanksgiving.